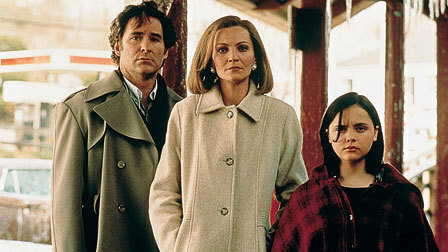 It's all in the dysfunctional family for Kevin Kline, Joan Allen (ctr.) and Christina Ricci in The Ice Storm. The 1997 film drama The Ice Storm is director Ang Lee’s (Life of Pi) adaptation of Rick Moody’s acclaimed 1994 novel of upper-middle-class American malaise. Suburban Connecticut, 1973: While Richard Nixon’s “I am not a crook” speech drones from the TV, the Hood and Carver families try to navigate a Thanksgiving break simmering with unspoken resentment, sexual tension, and cultural confusion. With a remarkable sense of clarity, subtlety and, surprisingly, humor, Lee’s renders the novel as a trenchant, tragic cinematic portrait of lost souls. The film features a fine cast of established actors, including Kevin Kline (The Extra man), Joan Allen (Pleasantville), Sigourney Weaver (Paul), and rising stars Tobey Maguire (The Cider House Rules), Christina Ricci (Bel Ami), Elijah Wood (The Lord of the Rings trilogy) and Katie Holmes (TV’s The Kennedys). I’m pretty sure it will only have English subtitles, as is usually the case with English-language films on the Criterion label.